Stogie Commentary: How and When Did You Start Smoking? While some stories are more exciting than others, it’s always interesting to learn how and when people became cigar smokers. We all share a common bond—a love of the leaf, if you will—and discovering the various paths we’ve taken to arrive at the same conclusion can help put our own experiences in perspective. Well, maybe that’s a reach. But, at the very least, we’re bound to come across a few worthy tales from occasional smokers and full-blown cigar enthusiasts alike. In that spirit, and even though the tot in this dated photo surely has a more interesting story than any of ours, here’s how (and approximately when) each StogieGuys.com team member got their start. I can’t remember my first cigar, but I’m fairly certain I smoked it during my high school days. Probably on the golf course or the back deck of my parent’s home in Chicago. I’m pretty positive, however, that I smoked it with my dad. He has casually enjoyed cigars for as long as I can recall and—way before I ever got to smoke one myself—wasn’t averse to taking me into tobacco shops or letting me hang around and enjoy the aroma of whatever he was smoking (back then, usually anything from Punch). Save for the summers back home, I mostly took a cigar hiatus as an undergrad, spending whatever disposable income I had at bars. It wasn’t until I moved to the nation’s capital to pursue a career and a master’s degree that I really increased my intake and, ultimately, started reading and writing about cigars whenever I could. I too don’t exactly remember my first cigar, but I’m reasonably certain I had it on a golf course when I was 16 or 17. I would go with a friend to a local magazine/card shop/smoke shop to peruse the cabinet humidor. Thankfully, we went for some decent handmade brands—Romeo y Julieta and Punch, at first—and they accepted my shoddy fake ID. Before I knew it, I purchased a Cigar Aficionado and was buying cigars from a local shop based on their CA ratings, always to be smoked while golfing, sailing, or at the beach. CAO Cameroon and Maria Mancini were two of my favorites back then. A few years later, during college, I was smoking a cigar every month or two, and even smuggled my first box of Cuban cigars into the country. Once I graduated, entered the “real world,” and had a back deck, I caught the cigar bug full blast. I wish I had a better story—or at least a clearer memory—of how I got interested in cigars. I suppose it goes back to cigarettes, which I smoked for 25 years or so. I quit sometime in the 1980s when it began to get more and more difficult to light up. I had my last Marlboros when it was still possible to smoke at your desk and just about everywhere else. I used to joke that I was going to start smoking again when I retired. Before that, though, we bought a small condo in Florida and on vacations there I was exposed to cigars. Like Miami, the cigar culture is pretty strong around the Tampa area. Somehow, I just fell into it. And fell for it. So, now that we’ve shared our tales, how and when did you start smoking cigars? I remember the very first cigar I finished was a mysterious Cuban RyJ in Indonesia that was way over humidified. I remember lighting like I would a cigarette with a Zippo. Strangely enough, it managed to burn to the end with little problems. It was about 3 years after that experience when I was 25 that I started to take cigars seriously and 2 years on, I'm glad I did. My first premium handmade cigar was smoked back in college. I didn't really enjoy the Phillies and Swishers that guys kept bringing to our card games. There was something about smoking a cigar I did like though and one day when I saw a small humidor in a wine shop I bought a cigar for the card game and was blown away. It was either an H.Uppman of an Avo. I can't remember which, but in comparison to the Phillie blunts it might as well been a Cuban Cohiba. It was a while longer before cigar became the obsession they are for me today, but that got me started down the path and, needless to say, I never went back to drug store cigars again. My first cigar was a Cuban RyJ that a buddy brought back from Europe. I smoked it in high school, and smoked one or two cigars a year for the next couple of years. I got into cigars when my wife and I were expecting our first child. I decided to buy a box of cigars to hand out at the birth, and I discovered the amazing variety available. I wasn't sure what to buy, so I picked up a couple samplers. And I was hooked. Six months later, I was operating out of three desktop humidors and looking for more space. I went on vacation to Key West bought a few fake cubans and brought them back, did not know they were fake at the time. Got back home and bought a humidor for them. Started filling the humidor up with cigars from the local shop and have been hooked ever since. My first premium cigar was enjoyed on a short vacation in San Luis Obispo, CA. I was there with a lady-friend and we stopped into the Sanctuary cigar shop. To the best of my memory, it was an Hoyo de Monterrey Excalibur. I enjoyed it enough to go back for another the next day. I don't remember my first cigar but I think it was Cuban Cohiba while on a trip Mexico. I started to get into cigars while in Puerto Rico back in '01 or '02. We were having an after party for customers at a gaming show and a salesmen came through handing out Romeo y Julieta's to everyone. Sitting on the beach at the Ritz-Carlton I thought I could really get into these. I have never looked back. Like George, I was a cigarette smoker for about 10 years. Several months after I quit, I started smoking the odd cigar here and there, usually cheap machine mades. I didn't want to addiction back, but I still wanted to enjoy tobacco occasionally. About 8 years ago at a friend's wedding I was given an Ashton, and found out how good premium cigars could be. I smoked every now and then for the next few years, until about two years ago when I started to deliberately read and learn more about cigars, and expanded my horizons a little bit. I now know what I like and what I don't like, and am starting to fill up my humidor. Like others, I was trying to quit cigarettes. I had smoked a handful of cigars before, mostly when they were offered to me but they always left me unimpressed. To quit cigarettes I resorted to cheap cornerstore swishers, colts and captain blacks knowing I would have something to puff on but not inhale, hence I would quit smoking. A few month of this made me realize that I liked the idea. Cigarettes were a thing of the past but cigars were growing on me. I started looking for other flavors and larger formats but being unaducated I kept buying them at the corner store. Until one day, an old friend (non-smoker) decided to bring me a four year old Montecristo #5 from his father's humidor. It was an eye opener. I immediately started spending most my money on cigars and humidors and all my free time on learning about them. 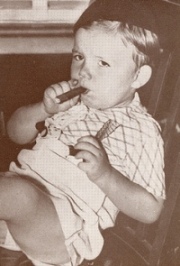 I was twenty four years old, and had never even been exposed to cigars until my very first one. Gurkha Symphony. My two best friends and I were each expecting our first children (about 6 weeks apart). The first one to pop was scheduled, so the night before the three of us got together and went to our local booze market and thought "why not-it's the thing to do with your first child" and each bought a cigar. None of us had had one before, so we smoked them to the nub and got sick as dogs, but that's where mine started. A few books, blog reads, and a humidor later, I'm hooked. There is such a culture around cigars. Always more to learn! I smoked cigarettes for awhile but the taste began to annoy me. Then one day, while in a tobacco shop, i decided to get an ACID: Blondie cigar from Drew Estates and it was amazing. Been enjoying them ever since.